I am a HUGE fan of wigs. Not just for fun but for everyday. I used to cut and color my hair way more than I should and then I found myself having dried out and unmanageable hair. I had already been wearing extensions for a long time but wasn’t a big fan of the long process. The clip in extensions always felt like they were ready to fall out and the other methods left my hair very damaged. One day I was at a beauty supply store and wandered into the wig section and saw how affordable most wigs were and not to mention how easy it was to slip them on and off! I left the store that day with one short dark bob wig and another long blond wig! I have since then turned to purchasing wigs online since I can find better deals and more selection. Getting tired of your long locks but too attached to them to cut off all that length? Are you dying to try a bold hair color but worried it might not be a safe look for the office? Wigs are great for those that are tired of their current hairstyle but not ready to commit to a totally different hair color or cut! A wig allows you to try out a daring and bold hairstyle or new hair color without the commitment and hassle. Wigs come in all lengths, textures and colors. The best thing is you don’t have to worry about damaging your hair by going from brunette to bleach blond or curly to pin straight. Owning a wig will save you so much time, especially on those mornings when you are running late or when your hair won’t cooperate. Many people ask me, “Can’t people tell you’re wearing a wig?” The short answer is, NOPE and if they can, “Who cares!” I have yet to run into anyone that has come up to me and asked if I was wearing a wig. One thing that you do have to do is make sure that you take your wig to a hair stylist. They will help shape it to your face. Don’t wear your wig right out of the package! The video below shows how to put on a wig properly. If your wig has bangs get some of those tiny nail scissors and trim the bangs a bit for a more natural look. You’ll need a wig cap or two to hide and control your real hair. Don’t be afraid to style your wig as you would your real hair. Use accessories and headbands to vary the hairstyles. If you still feel self conscious and like everyone knows you are wearing a wig then go ahead and throw on a hat or a scarf over it! This works best with long length wigs. Now you can have have gorgeous long locks instantly without the hassle of extensions! 1. 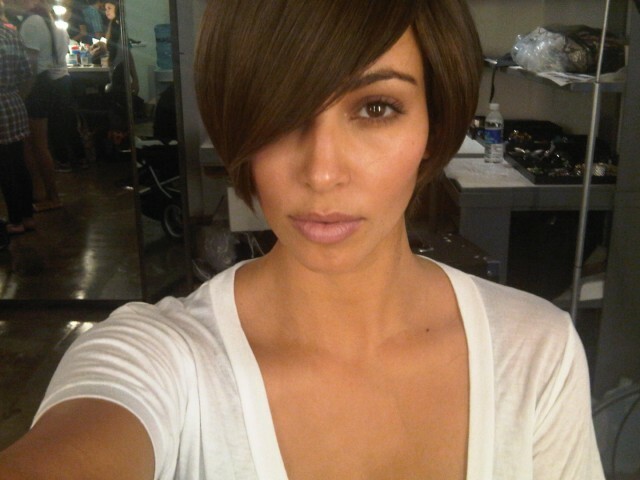 To avoid the fake wig look, take it to a hairstylist to get some real layers that fit your face cut. A professional hair stylist can cut real human hair or synthetic hair wigs. 2. If you plan on wearing your wig almost everyday pick a natural looking color and style. Make sure there isn’t too much hair near the crown, otherwise it will look too bulky. 3. Keep your wigs shape by using a wig head. 4. Dust synthetic hair wigs with a little baby powder or loose powder in a similar shade to get rid of that shiny look. 5. Wigs with bangs are easier to wear. 6. Look for a wig that has adjustable elastic bands to ensure a tight and secure fit. Do you own any wigs? Would you consider wearing a wig to work or out with friends?